Why make this stuffed cucumber snack recipe? Are you troubled by Hot Summer? Or are Bored and Irritated with Fried Masala - spicy Snacks? Try this Low Cal Delicious cucumber Snack that is easy to prepare and is cool and simple. 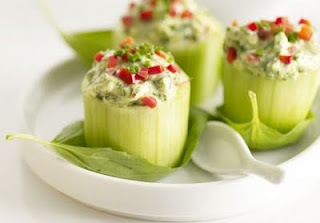 This snack of chopped cucumbers stuffed with seasoned cottage cheese is a cooler and refresher. Makes a great eat for parties or barbecue lunches. How to make cool cucumber snack? I am giving 3 suggested combinations below. These ingredients are to be blended with Crumbled or Grated cottage cheese or hung curd. The proportion is suggested, adjust according to your taste. Peel the cucumbers and cut into 2-3 pieces vertically. Carefully scoop out the seeds, an apple corer is quite useful in doing that. Make the pieces stand with open side up(as shown in the image above)and stuff with the prepared stuffing. Top with grated cheese, carrot or sprinkle seasoning. Can be served on a bed of lettuce or basil. Crackers or Nachos make a good bite with it. Thanks you for sharing this recipe with all of us here. I am so grateful to you guys. I have been trying this dish for five days in a row and I am going to cook this today as well. I just cannot stop making it. Happy that you liked my idea.A refreshing and welcome break. Light on the stomach and good to eat. this really looks lovely and i am sure it is going to taste great. i am going to try this as soon as i get the cucumber. i have other ingredients at home. can't wait to try this.